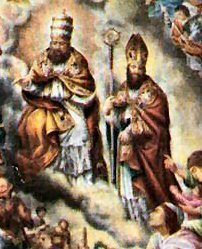 Old Calendar: St. Cornelius, pope and martyr and St. Cyprian, bishop and martyr; Sts. Euphemia, Lucy and Geminanus, martyrs. Today the Church commemorates two friends in the service of Christ and his Church. Cornelius, a Roman, was the twenty-first Pope during the reign of the Emperor Gallus and Volusian. He had to oppose Novatian, the first anti-pope, who believed that apostates who repented could not be forgiven. Helped by St. Cyprian, Cornelius confirmed his papal authority. He was beheaded in exile at Civitavecchia, Italy in 253. Saints Cyprian and Cornelius are mentioned in the Roman Canon (Eucharistic Prayer I) of the Mass. According to the 1962 Missal of Bl. John XXIII the Extraordinary Form of the Roman Rite, today is the feast of the commemoration of Sts. Euphemia, Lucy and Geminianus. Veneration of St. Euphemia, a virgin of Chalcedon martyred under Diocletian, was widespread in the East. Over her tomb was built the basilica in which assembled the Council of Chalcedon in 451. St. Euphemia was also venerated in the West, especially in Italy. St. Lucy is the martyr of Syracuse. Little is known of St. Geminianus whose cult is associated with that of St. Lucy. Pope Cornelius (251-253) was the successor to Pope Fabian. During his reign a controversy arose concerning the manner of reinstating those who had fallen from the faith under the duress of persecution. The Novatians accused the Pope of too great indulgence and separated themselves from the Church. With the help of St. Lucina, Cornelius transferred the remains of the princes of the apostles to places of greater honor. On account of his successful preaching the pagans banished him to Centumcellae, where he died. St. Cyprian sent him a letter of condolence. At the time of Pope Cornelius there were at Rome forty-six priests, seven deacons, seven subdeacons, forty-two acolytes, fifty-two clerics and more than five hundred widows who were supported by the Church (according to Cornelius' letter to Bishop Fabian of Antioch). Patron: against ear ache; against epilepsy; fever; cattle; domestic animals. Symbols: horn and triple papal cross; cows or oxen; font; tall cross; sword; also papal symbols of tiara, church and/or triple cross; martyr's crown; palm frond (for martytr); papal tiara. Thascius Caecilius Cyprianus, illustrious as a pagan rhetorician in Carthage, embraced the true faith in the year 246 and was soon thereafter consecrated priest and bishop of that city (248). He was an energetic shepherd of souls and a prolific writer. He defended the unity of the Church against schismatic movements in Africa and Italy, and greatly influenced the shaping of Church discipline relative to reinstating Christians who had apostatized. He fled during the Decian persecution but guided the Church by means of letters. During the Valerian persecution (258) he was beheaded. He suffered martyrdom in the presence of his flock, after giving the executioner twenty-five pieces of gold. St. Jerome says of him: "It is superfluous to speak of his greatness, for his works are more luminous than the sun." Cyprian ranks as an important Church Father, one whose writings are universally respected and often read in the Divine Office. His principal works are: On the Unity of the Church; On Apostates; a collection of Letters; The Lord's Prayer; On the Value of Patience. Symbols: twenty gold coins; crown; axe; palm frond (for martytr); martyr's crown; bishop's mitre. Read St. Cyprian's encouraging words to the martyrs of his day, learn more about Roman persecutions, catacombs, apostates, Novatian and Novatus. Study the Sacrament of Penance. At Chalcedon, were the deaths of St. Euphemia, virgin and martyr, under Emperor Diocletian and the proconsul Priscus. For her faith in our Lord she was subjected to tortures, imprisonment, blows, the torment of the wheel, fire, the crushing weight of stones, the teeth of the beasts, scourging with rods, the cutting of sharp saws, and burning pans, all of which she survived. But when she was again exposed to the beasts in the amphitheater, praying to our Lord to receive her spirit, one of the animals inflicted a bite on her holy body although the rest of them licked her feet, and she yielded her unspotted soul to God . . . At Rome, the holy martyrs Lucy, a noble matron, and Geminanus, were subjected to grievous afflictions and were for a long time tortured by the command of Emperor Diocletian. Finally, being put to the sword, they obtained the glorious victory of martyrdom.